BARCELONA — This seaside city of fine art and architecture is where Christopher Columbus first set foot after his new world discoveries, where Pablo Picasso and Salvador Dali found inspiration for their art and where Derrick Rose searches for his jump shot. That’s one of the subplots for USA Basketball — the entire team’s shooting, actually — as the team opens single elimination play Saturday in the round of 16 against Mexico (9:00 a.m. CT | ESPN2). The USA with a 5-0 week of so called pool play is a heavy favorite to advance to the final four next weekend in Madrid against co-favorite Spain. Rose’s 25 percent field goal shooting and 5.4 scoring average have raised some outside questions and ever present concerns. Though the USA team as a whole has shot poorly, 34 percent on threes, among the lower half in the tournament. But Rose as the team finished a workout their first day in Barcelona Friday, was upbeat and lighthearted along with USA coach Mike Krzyzewski. All according to plan, they suggested, especially with this recent five games in six days. “I’m loving the way that I’m playing,” Rose told reporters after practice. “Of course, missing shots, that’s part of the game. But just conditioning wise and how I’ve been playing defense and low turnovers the last couple games, I’m loving the way that I’m playing. And neither is Krzyzewski, the famously stern Duke coach who had some fun with media as the daily questions came about, sigh, the health of Rose and his knees. “Great, he’s great,” said Krzyzewski, who as an assistant on that team also spent some time rhapsodizing about the operatic singing in the 1992 Dream Team Olympics opening ceremonies in Barcelona. “I think at some time everyone should stop asking about him physically and just say, ‘How’s your game? You think we’re going to win? How’d you like that pass?’ Although it’s nice when people say, ‘How do you feel?’ When that’s the only thing they say, then you say, ‘C’mon, man, let’s have a more in depth conversation.’ I think he’s ready for that. Hey, Tapas and orange whips all around. Did you know Barcelona was named for Hamil Barca, the father of Hannibal, who led his army elephants from here over the Pyrenees to attack Rome? No DeMarcus Cousins reference. But the USA players were enjoying themselves after a 5-0 week in Bilboa as the tournament becomes more serious with this week’s single elimination games. Perhaps a team led by Gustavo Ayon may not be that serious a threat. So the USA players push themselves, and Rose is eagerly in that group. Rose, of course, got his daily dose of “How are you?” questions and smiled. USA assistant and Bulls coach Tom Thibodeau added Rose continues to please him, and that’s not always easy. “Mentally, he’s strong,” said Thibodeau, whom USA Basketball officials have raved about for his familial ways with the team. “I thought his defense was terrific. He’s not making shots right now. But each day he’s gotten more and more comfortable. Doing a good job running the team and we just want him to continue to concentrate on his improvement. But physically he feels great. “He hasn’t played in a long time. That (erratic shooting) was to be expected,” added Thibodeau. “The more he plays the more his timing will come around. Right now he’s missed some layups that are usually automatics. That will come, I think, as he finds the rhythm of the game; it will get better and better for him. He’s not playing a lot of minutes, so it’s a different role for him. Physically he’s good. He says he feels great. We’re watching the way he’s moving. He’s been great in practice, great in the games. 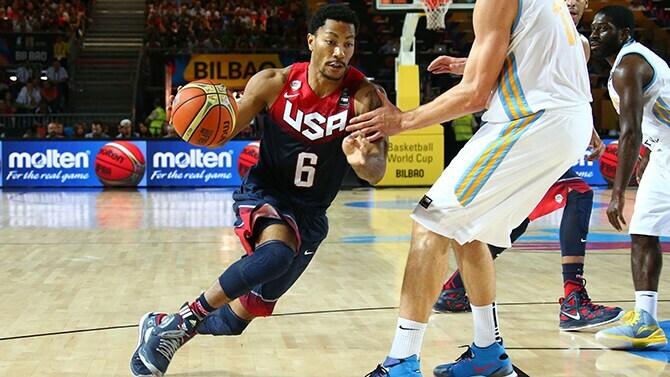 Furthermore, it’s a different role for Rose off the bench as he continues to embrace the setting and the play. “Coming off the bench, this is the first time in my life doing this,” Rose added about his play behind Kyrie Irving, who is expected to start Saturday after a slight back injury Thursday. “That’s what makes our team so unique and so deep. With me in the second unit, I believe there is no second unit that can stick me when I’m on the floor. And it’s vice versa with Kyrie if he were to come off the bench. It would be no one that would stick him. As far as a whole, we just have to do better with executing our plays, run the floor and get used to each other. This is our first time ever competing in something like this with a new team where you had so many other players drop out like Durant, K-Love, Westbrook, Eric Gordon, everybody that was on the 2010 team. We just have to get adjusted to the new players that made this team and keep it going. Usually when we get into people, we change the game. That’s the only thing we have to worry about is defense. Offensively, I think we shouldn’t have anything to worry about because we have so many threats on this team. But getting into people, turning people, putting pressure on them the entire game, we have to wear on people. Did you know Napolean conquered here in the early 19th Century before Waterloo and placed his brother Joseph on the throne. Joe Bonaparte? It’s a Rose by the same name who has been sweet for the USA team even with some shots going awry.